Species: Carp, Crusians, F1'S, Tench, Roach, Rudd and Perch. Average size: Carp average at 1lb but there are odd lumps too 8lb. Rules: Keepnets in matches only. Barbless hooks only. Only Holly Farm pellets and groundbait can be used for feeding. Any pellet can be used on the hook. Always use your landing nets on fish. Top baits: Pellets, Meat, Caster, Paste and Corn. Recommended tackle: A 10 to 12 elastic or equivalent to white hydro is ideal. 0.12 to 0.14 hook lengths. Small pole cups are essential for accurate far bank feeding. 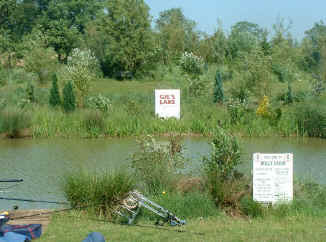 Gils is a superb pool which has been fashioned like a canal, meaning the far bank is easily reachable with normal pole tackle. Not that you have to fish right across, pleasure anglers can catch right under there feet and during the summer months, fishing shallow straight down the middle is a tactic that's often responsible for 100lb plus nets of fish. 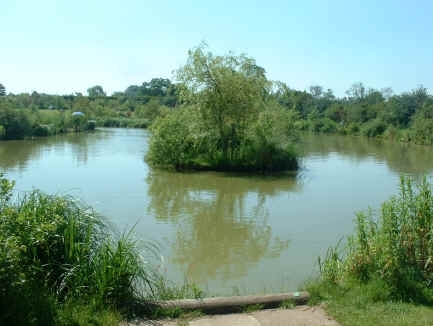 This pool is absolutely solid with fish of all species and during the summer months, regular loose feed with either pellet or caster will draw the fish right up in the water where they can be seen just under the surface competing for your hook bait. Get them feeding like this and 100lb is guaranteed.